This entry I got from my friend via my hotmail's email. Depend on you whether you want to believe it or not. 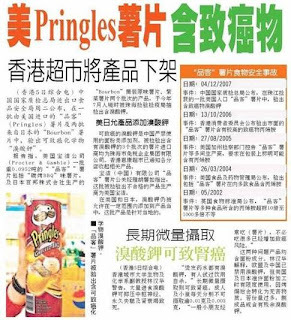 The chemical used in Pringlesis also used in hair-perm chemical, a very harmful chemical even on a very insignificant quantity (will cause kidney cancer), adult shouldn't consume more than 0.01g per day while children not more than 0.003g! Product called back from all Hong Kong markets & banned in USA. It contains cancer causing ingredient ! ....and they were so terrified of "the melamine scare' from China. Pringles is from USA. Let them all know please...in the interest of Health. melamin tu ader unsur2 babi dowh !! 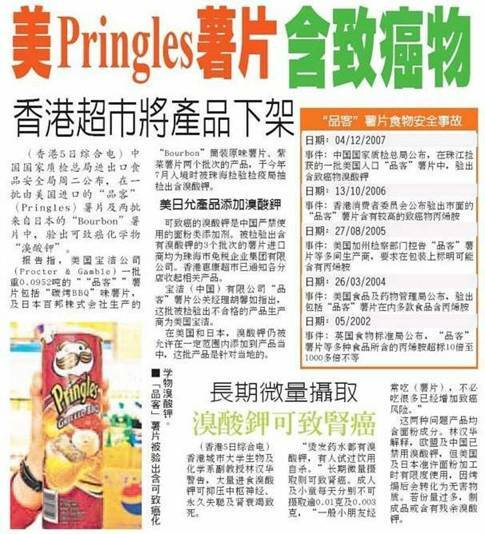 pringles di Malaysia dikilangkan di Malaysia...? ms nury: oh yea ke...ak bru je tau...ble godek2 email lme, jmpe kwn forward email psl ni...trus share..
dah lamer xmkn bnde ni lagi..
tgk org beli xtliur lnsg ble tgk xde tnda halal.. sedara ade jugak mkn tp kdg2 xbrani nk tegur..
slow jer ckp xleh mkn,biarpun muka tebal..